What started out looking like a bad night for Virginia’s Democratic gubernatorial candidate Terry McAuliffe turned into a bad night for the Associated Press. The wire service’s report that McAuliffe had lied to a federal official investigating an alleged annuities scam turned out to be incorrect, and the AP retracted the story. The initial report, from AP political writer Bob Lewis, cited a 2011 indictment against a man named Joseph Caramadre, who you may recognize from stories on This American Life and Pro Publica as the man who figured out a way to reap the benefits of death annuities on strangers. 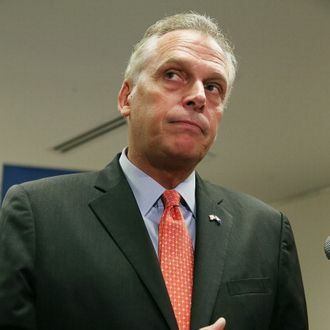 Lewis reported that the indictment “alleges that McAuliffe misled a federal postal inspector who was inquiring about a $2,000 check Caramadre had sent him.” But the indictment, which used the initials T.M., was referring to someone else. McAuliffe’s name really did appear on a list of Caramadre’s investors. But the significant detail that he was accused of lying to investigators about it was a mistake, apparently due to a mix-up of the initials. The indictment accuses “T.M.” of referring terminally ill patients to Caramadre in exchange for money. T.M. apparently told officials the money was for construction work he did in Caramadre’s house, which maybe should have been a tip-off the initials didn’t refer to the former chairman of the Democratic Party. They strongly deny the Lewis report. They contend that the “T.M” in the court document is not the candidate. Of course, none of this helps Virginia voters in their difficult decision next week.